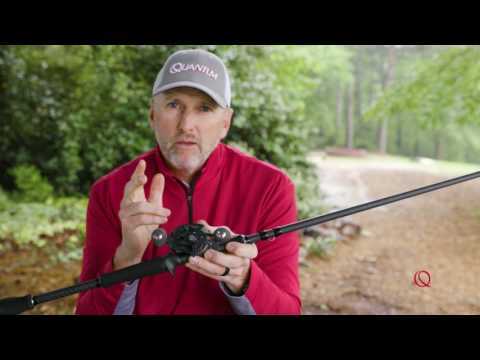 Quantum is confidently calling their new Tour® the best baitcasting reel they’ve built in the brand’s 30-year history. Engineered with 8 anti-corrosion, 2 speed bearings, and 1 roller bearing, all 11 Performance Tuned bearings are built for both big bass or harsh saltwater conditions, and a sapphire jeweled spool tension washer much like high-dollar watch crystals are made of for a smoother harder surface for the spool shaft to turn against. Tour® is indeed a fine piece of machinery. Using computer-aided-design, Quantum engineers designed an aluminum frame that strikes the perfect balance between weight and strength. The unique structural design holds critical gears and bearings in perfect alignment to insure optimum performance for both cast and retrieve and insures gears stay smooth after hundreds of days on the water. A 95mm power handle is constructed of multiple layers of carbon fiber for an incredibly stiff and strong handle to whip the biggest fish in the lake, and it looks pretty cool too. A precision stainless steel clutch bearing is designed to withstand bone jarring hooksets without any backward handle movement. Release the lever and the side cover springs open for convenient access to the spool. The cover is tethered to the frame so you never need to worry about dropping it overboard. Every PT reel comes from the factory with our proprietary PT Hot Sauce lubricants. Its formulated specifically for fishing reel applications to lower friction and increase the longevity of each reel. Super smooth patented sapphire tension washers support a micro polished spool shaft to give greater casting control and distance with less effort. We invented the externally Adjustable Centrifugal System that made the hassle of adjusting brake weight settings a thing of the past. With our newest ACS 4.0, we’ve raised the bar yet again. As always, you can precisely adjust the amount of braking force with a turn of the ACS dial and now we’ve added more adjustment settings for fine tuning. Also, near the end of each cast, the brake weights disengage at low spool RPM so you get that extra few feet of casting or pitching distance. Larger diameter spools perform better, period. That’s why we employ OST on our newest Smoke S3 and Tour S3 platforms. An oversized 35.5 mm spool is fitted into a low profile 100 size frame. We manufacture the spool from 6061-T6 aluminum which is extremely lightweight and strong. This design yields higher retrieve speeds (in inches per turn) and a spool that accelerates faster to yield effortless casting performance. PT Speed Bearings on the spool shaft create the ultimate casting machine. We tested dozens of different bearing combinations in our Q Lab saltwater torture chamber before we found the perfect combination of materials and lubrication to withstand the harsh effects of Mother Ocean. Our PT AC bearings will resist rust and salt buildup to keep your reel running smooth even in the harshest saltwater conditions. PT Bearings are built to our exact design standards of performance specifications. We’ve tested hundreds of bearings in our Q Lab to determine the exact bearing specifications that can stand up to the abuse and stress from the most demanding anglers. PT Gears are designed by our proprietary CAD program and manufactured to precise tolerances to yield world class smoothness. Durable high strength materials are used so your reel will handle heavy use for years to come without compromise. 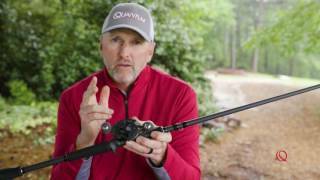 “Is this 20 or 25lb line on this reel?” This might be a commonly occurring question during your fishing career. Never be unsure again by adjusting the convenient line memo to correspond to your line size. Countless designs and 3D models were evaluated before choosing our newest baitcast platform design shape. A low profile cover fits perfectly in your hand while your thumb rests on the frame’s thumb rest. You’ll experience less fatigue and greater sensitivity than ever before and the oversized spool is designed to fit into one of our lowest profile packages ever. We've added an extra 5mm of length (95mm) to our high strength power handle with oversized EVA knobs to provide the extra winching power to get that hawg out of the nastiest cover. The “Achilles Heel” of many baitcast reels is a poorly designed thumbar system that creates reliability problems. Our newest design features a stainless steel kick lever that will not wear out and we’ve added an anti-corrosion barrier plate between the frame and kick lever system to eliminate sticking issues created from saltwater corrosion. The thumbar is also mounted higher on the reel for more comfortable operation cast after cast. Multiple anodize, primer, and finish coatings create a sealed barrier of saltwater protection to ward off the effects of Mother Ocean. The pinion gear is held exactly in place by two ball bearings so there is no contact with the spool shaft during casting, thus eliminating any friction. With a properly adjusted ACS system, casts are freakishly long. Our patented multi drag disk design combines carbon and ceramic washers to perfectly balance smoothness with power. The carbon washers provide durable braking force while the ceramic washers dissipate heat while retaining “out of the box” smoothness. If you are “that guy” who likes to winch them out of cover, our PT drag design easily achieves lockdown exceeding 20 lbs. A precision stainless steel clutch bearing is designed to withstand bone jarring hooksets without any backward spool movement.